For other uses, see Dubarry. Jeanne Bécu, Comtesse du Barry (19 August 1743 – 8 December 1793) was the last Maîtresse-en-titre of Louis XV of France and one of the victims of the Reign of Terror during the French Revolution. Jeanne Bécu was born at Vaucouleurs, in the present-day Meuse department in Lorraine, France, as the illegitimate daughter of Anne Bécu, a seamstress. Jeanne's father was possibly Jean Jacques Gomard, a friar known as frère Ange. During her childhood, one of her mother's acquaintances (possibly briefly a lover), Monsieur Billiard-Dumonceaux, and possibly father of Jeanne's half-brother Claude (who died in infancy when only ten months old) took both Anne and three-year-old Jeanne into his care when they traveled from Vaucouleurs to Paris and installed Anne as a cook in his Italian mistress's household. Little Jeanette was well liked by Dumonceaux's mistress Francesca (known in French as Madame or La Frédérique), who pampered her in all luxury. Dumonceaux funded Jeanette's education at the Couvent (convent) de Saint-Aure. At the age of fifteen, Jeanne left the convent, for she had "come of age". For some reason – possibly due either to La Frédérique's jealousy of the former's beauty or because Dumonceaux's passion for Anne revived – both mother and daughter were thrown out. They then moved into the very small household of Anne's husband, Nicolas Rançon. Jeanne had to find some sort of income to help herself live, and thus traveled the dingy streets of Paris carrying a box full of trinkets for sale. Over time she worked at different occupations; she was first offered a post as assistant to a young hairdresser named Lametz; Jeanne had a brief relationship with him that may have produced a daughter, although it is highly improbable. On the instigation of a Gomard (possibly the brother of her supposed father), Jeanne was then employed as a companion (dame de compagnie) to an elderly widow, Madame de la Garde, but was sent away when her youth and beauty began to meddle in the marital affairs of both la Garde's two sons. Later, Jeanne worked as a milliner's assistant (known as a grisette) in a haberdashery shop named 'À la Toilette', owned by Madame Labille, and run by her husband. Labille's daughter, the future famed painter Adélaïde Labille-Guiard, became a good friend of Jeanne. As reflected in art from the time, Jeanne was a remarkably attractive blonde woman with thick golden ringlets and almond-shaped blue eyes. Her beauty came to the attention of Jean-Baptiste du Barry, a high-class pimp/procurer nicknamed le roué. Du Barry owned a casino, and Jeanne came to his attention in 1763 when she was entertaining in Madame Quisnoy's brothel-casino. She introduced herself as Jeanne Vaubernier. Du Barry installed her in his household and made her his mistress. Giving her the appellation of Mademoiselle Lange, Du Barry helped establish Jeanne's career as a courtesan in the highest circles of Parisian society; this enabled her to take several aristocratic men as brief lovers or clients. As Mademoiselle Lange, Jeanne immediately became a sensation in Paris, building up a large aristocratic clientele. She had many lovers from the king's ministers to his courtiers. The dashing yet old Maréchal de Richelieu became one of her recurring lovers. Because of this, Jean du Barry saw her as a means of influence over Louis XV, who became aware of her in 1768 while she was on an errand at Versailles. The errand involved the duc de Choiseul, Minister of Foreign Affairs, who found her rather ordinary, in contrast to what most other men thought of her. In any case, Jeanne could not qualify as a maîtresse-en-titre unless she had a title; this was solved by her marriage on 1 September 1768 to du Barry's brother, Comte Guillaume du Barry. The marriage ceremony included a false birth certificate created by Jean du Barry himself, making Jeanne younger by three years and of fictitious noble descent. Jeanne was now installed above the King's quarters in Dominique Guillaume Lebel's former rooms. She lived a lonely life, unable to be seen with the King since no formal presentation had taken place as yet. Very few if any of the nobility at court deigned to become acquainted with her, for none could accept the fact that a woman of the street had the audacity to mingle with those above her station and thrive in trying to become like them. Comte du Barry constantly pestered Jeanne and urged her to speak of presentation with the king. Louis XV, in turn, asked her to find a proper sponsor to be able to have one. Richelieu took responsibility of doing so, and after those women approached asked too high a price to take the role, her official sponsor, Madame de Béarn, was found after having her huge gambling debts paid off. On the first occasion when the presentation was to take place, de Béarn was panicked by fear and feigned a sprained ankle. On a second occasion, the king was badly hurt when he fell off his horse during a hunt and broke his arm. Finally, Jeanne was presented to the Court at Versailles on 22 April 1769; an occasion which was long-awaited for by the gathering crowds outside the palace gates, and by the gossiping courtiers within the Hall of Mirrors. Jeanne was described as wearing a queenly silvery white gown brocaded with gold, bedecked in jewels sent by the king the night before, and with huge panniers at the sides. The dress had been specifically ordered by Richelieu especially for Jeanne; many courtiers claimed that its like had never been seen before. Her hairdo was also noticeably spectacular, being the cause of her late arrival. Jeanne first befriended Claire Françoise, better known as 'Chon', brought from Languedoc by her brother Jean du Barry to accompany her then-friendless sister-in-law, being also a means of companionship and tutor in helping Jeanne let go of her peasant past and take a more court-like demeanour. Later on, she also befriended the Maréchale de Mirepoix. Other women of nobility were bribed into forming her entourage. Jeanne quickly accustomed herself to living in luxury (to which she had already been introduced whilst living with Dumonceaux). Louis XV had also given her a young Bantu slave, Zamor, whom she dressed in elegant clothing to show him off. According to Stanley Loomis’ biography ‘Du Barry’, Jeanne’s everyday routine began at 9am, when Zamor would bring her morning cup of chocolate. Later she would be dressed in a fine gown of choice and dressed in her jewellery. Accordingly, either hairdresser Nokelle for special occasions, or Berline for everyday styles, would come to do her hair in powders and curls. She would then receive friends, dressmakers, jewellers and artists showing off their new stock hoping she would be interested in buying something of their offers. She was indeed extravagant, but her good nature was not spoiled. When the old Comte and Comtesse de Lousene were forcibly evicted from their château due to heavy debts, they were sentenced to beheading because the Comtesse had shot dead a bailiff and a police officer while resisting. To their great fortune, they were good friends with Madame de Béarn, who told Jeanne of their situation. Though warned by Richelieu of her possible failure, she asked the king to pardon them, refusing to rise from her kneeling posture if he did not accept her request. Louis XV was astounded and his heart thawed, saying, "Madame, I am delighted that the first favour you should ask of me should be an act of mercy!" A second similar act happened when Jeanne was visited by a certain Monsieur Mandeville who asked pardon in the name of a young girl condemned to the gallows convicted of infanticide for giving birth to a still-born and not informing the authorities. Jeanne wrote a letter to the Chancellor of France, who granted the pardon. Jeanne was a tremendous triumph. She now wore extravagant gowns of great proportions both in creation and cost, exhausting the treasury all the more. With diamonds covering her delicate neck and ears, she was now the king's maîtresse déclarée. Due to her new position at Court, she made both friends and enemies. Her most bitter rival was the Duchesse de Gramont, Choiseul's sister, who had in vain tried her best to acquire the place of the late Marquise de Pompadour, and according to Diane Adélaïde de Mailly, Béatrix de Gramont would have disdained the comtesse no matter what. She had, since the beginning, plotted with her brother for the removal of Jeanne, even going to the extent of slandering her name as well as the king’s on gutter pamphlets. In time Jeanne became acquainted with the Duc d’ Aiguillon, nephew of Richelieu, who sided with her against the opposing Duc de Choiseul. As Jeanne’s power in court grew stronger, Choiseul began feeling his was waning, and against the king’s wishes after the terrible Seven Years' War incident, he decided France was capable of war again and sided with the Spanish against the British for possession of the Falkland Islands. When this plot came to light to the du Barry clan, the mistress exposed all to the king and, on Christmas Eve of 1771, Choiseul was dismissed of his ministerial role and from court, ordered by his majesty to exile to his Chanteloup property along with his wife and sister. Jeanne’s golden age had finally truly arrived. She was rid of Choiseul and Grammont, comte Jean du Barry was dealt with and her family had the benefits they deserved as relations to the mistress. Her mother, Anne, was now Marquise de Montrabé, residing in a luxurious apartment in the Couvent (convent) de Sainte-Elisabeth. While Jeanne was part of the faction that brought down the duc de Choiseul, she was unlike her late predecessor, Madame de Pompadour, in that she had little interest in politics, preferring rather to pass her time ordering new ravishing gowns and all sorts of complementary jewellery. However, the king went so far as to let her participate in state councils. A note in a modern edition of the Souvenirs of Mme. Campan recalls an anecdote: the king said to the duc de Noailles, that with Madame du Barry he had discovered new pleasures; "Sire" – answered the duke – "that's because your Majesty has never been in a brothel." While Jeanne was known for her good nature and support of artists, she grew increasingly unpopular because of the king's financial extravagance towards her. She was forever in debt despite her huge monthly income from the king – at one point three hundred thousand livres. Her relationship with Marie Antoinette, who was married to the Dauphin of France (the future Louis XVI), was contentious. The first meeting of the two was during a family supper at the Château of La Muette on 15 May 1770, a day before the great wedding. Jeanne had only been official mistress a little over a year, and many thought she would not be included in the list of guests for the occasion. It ended up being otherwise, to the disgust of most of those present. Marie Antoinette noticed Jeanne, who stood out from the rest of the crowd with her attractive extravagant appearance and a high talkative voice. The Comtesse de Noailles informed Marie Antoinette that the role of that woman was to give pleasure to the king, and the innocent 14-year-old archduchess added that she would thus be her rival at such a role. The Comte de Provence soon after divulged the true nature of such pleasure, causing instant hatred in Antoinette towards Du Barry for such immorality. This rivalry kept on for quite some time, especially since also the dauphine supported Choiseul as the proponent of the alliance with Austria. Marie Antoinette defied court protocol by refusing to speak to Madame du Barry, owing not only to her disapproval of the latter's background, but also after hearing from the Comte de Provence of Du Barry's amused reaction to a story told by the Prince de Rohan during one of her dinner parties, in which Marie Antoinette's mother, Maria Theresa, was slandered, adding therefore yet another foe to her list. Madame du Barry furiously complained to the king, who in turn complained to the Austrian ambassador Mercy, who in turn did his best in convincing Marie Antoinette to ease her ways. Eventually, during a ball on New Year's Day 1772, Marie Antoinette spoke indirectly to Du Barry by tossing in her direction the words "There are many people at Versailles today,"  giving her the option to take or leave. In 1772, the infatuated Louis XV requested that Parisian jewellers Boehmer and Bassenge create an elaborate and spectacular jeweled necklace for du Barry, one that would surpass all known others in grandeur, at an estimated cost of two million livres. The necklace, still not completed nor paid for when Louis XV died, would eventually trigger a scandal involving Jeanne de la Motte-Valois, in which Queen Marie Antoinette would be wrongly accused of bribing the Cardinal de Rohan, Archbishop of Strasbourg, Alsace, to purchase it for her, accusations which would figure prominently in the onset of the French Revolution. In time, the king started to show his age by constantly thinking of death and repentance, and began missing appointments in Jeanne's boudoir. During a stay at the Petit Trianon with her, Louis XV felt the first symptoms of smallpox. He was brought back to the palace at night and put to bed, where his three daughters and Madame du Barry stayed beside him. On 4 May 1774, the king suggested to Madame du Barry that she leave Versailles, both to protect her from infection and so that he could prepare for confession and last rites. She was relieved of her duties by Doctor Lemonnier and immediately retired to Aiguillon’s estate near Rueil, as were his wishes. Following the death of Louis XV and his grandson's ascension to the throne, Marie Antoinette had her husband exile Jeanne to the Abbey du Pont-aux-Dames near Meaux-en-Brie. At first she was not met warmly by the nuns, who knew that in their midst they had the thirty-one-year-old former royal mistress, but soon enough they grew accustomed to her timid ways and opened up to her, most of all the Abbess Madame de la Roche-Fontenelle. After a year at the convent, Jeanne was granted permission to visit the surrounding countryside on the condition she returned by sundown. A month later, she was given permission to leave the abbey but not to venture closer than ten miles towards Versailles, thus cancelling her idea of going to her beloved Château de Louveciennes. She then managed to purchase property belonging to the family of the wife of Madame de la Garde's younger son, who she knew from her teen-age years. Two years later, she moved to Louveciennes. In the following years, she had a liaison with Louis Hercule Timoléon de Cossé-Brissac. She later also fell in love with Henry Seymour (of Redland), whom she met when he moved with his family to the neighbourhood of the Château. In time, Seymour became fed up with his secret love affair and sent a painting to Madame du Barry with the words 'leave me alone' written in English at the bottom, which the painter Lemoyne copied in 1796. The duc de Brissac proved the more faithful in this ménage-a-trois, having kept Madame du Barry in his heart even though he knew of her affair with Seymour. During the French Revolution, Brissac was captured while visiting Paris, and was slaughtered by a mob. Late one night, Jeanne heard the sound of a small drunken crowd approaching the château, and into the opened window where she looked out someone threw a blood-stained cloth. To Jeanne's horror, it contained Brissac's head, at which sight she fainted. Du Barry's Bantu slave Zamor, along with another member of du Barry's domestic staff, had joined the Jacobin club. He became a follower of the revolutionary George Grieve and then an office-bearer in the Committee of Public Safety. Du Barry found out about this and questioned Zamor about his connections with Grieve. Upon realizing the depth of his involvement, she gave him three days’ notice to quit her service. This Zamor did without hesitation, and promptly proceeded to denounce his mistress to the Committee. Based largely on Zamor's testimony, Madame du Barry was suspected of financially assisting émigrés who had fled the French Revolution. The denunciation by Zamor happened in 1792, and Madame du Barry was finally arrested in 1793. In 1792, when the Revolutionary Tribunal of Paris accused her of treason and condemned her to death, she vainly attempted to save herself by revealing the hiding places of the gems she had hidden. During the ensuing trial, Zamor gave Chittagong as his birthplace, suggesting that perhaps he had some Bengali or Burmese blood in him, though this is purely speculative. His testimony sent the Comtesse to the guillotine, along with many others. On 8 December 1793, Madame du Barry was beheaded by the guillotine on the Place de la Révolution (now the Place de la Concorde). On the way to the guillotine, she collapsed in the tumbrel and cried "You are going to hurt me! Why?!" Terrified, she screamed for mercy and begged the watching crowd for help. Her last words to the executioner were: "One more moment, Mr. Executioner, I beg you!" She was buried in the Madeleine Cemetery, like many other executed during the Terror—including Louis XVI and Marie Antoinette. Although her French estate went to the Tribunal de Paris, the jewels she had smuggled out of France to England were sold by auction at Christie's in London in 1795. Colonel Johann Keglevich, the brother of Major General Stephan Bernhard Keglevich, took part in the Battle of Mainz in 1795 with Hessian mercenaries who were financed by the British Empire with the money from this sale. Many dishes are named after du Barry. All dishes "du Barry" have a creamy white sauce, and many have cauliflower in them. The cauliflower may be an allusion to her powdered wigs, which had curls piled high on top of each other like cauliflower curds. Japanese voice actress Ryoko Kinomiya in the famous anime The Rose of Versailles, as a villainous, scheming enemy of Marie Antoinette; her struggles with the young princess are a major concern of the story in its early stages. In The Idiot, by Fyodor Dostoyevsky, the character Lebedev tells the story of her life and execution and prays for her soul, among other souls. Du Barry is one of the central characters in Sally Christie's The Enemies of Versailles (2017). ^ Michel Antoine, Louis XV, Librairie Arthème Fayard, Paris, 1989, p. 887. ^ Haslip, Joan, Madame du Barry: The Wages of Beauty, Grove Weidenfeld, New York, 1992. ^ Stoeckl, Agnes de, Mistress of Versailles: the Life of Madame du Barry, John Murray, London, 1966, p. 23. ^ de Stoeckl, p. 43. ^ Loomis, Stanley Du Barry: A Biography, Lippincott, Philadelphia, 1959, re-ed. 1965, pp. 55–56. ^ Haslip, p. 32: 'The carriages, jewels....reclaim the money from the royal treasury. ^ Grey, Juliet (2011). Becoming Marie Antoinette. Ballantine Books. p. 322. ISBN 9780345523860. ^ Langon, Baron Etienne Leon Lamothe (2010). Memoirs of the Comtesse Du Barry; with intimate details of her entire career as favorite of Louis XV. Chapter XXV: Kessinger Publishing. p. 234. ^ Baumgold, Julie (2005). The Diamond: A Novel. Simon and Schuster. p. 136. ISBN 9780743274548. ^ Haslip, p. 78: "Prince de Rohan had made fun of the pious old Empress... No one, it appears, had laughed so heartily as the hostess"
^ Palache, John Garber (2005). Marie Antoinette The Player Queen. Steps to the Throne: Kessinger Publishing. p. 28. ISBN 9781417902507. ^ "The Diamond Necklace Affair". Marie Antoinette Online. 11 January 2009. Archived from the original on 30 September 2011. Retrieved 30 June 2011. ^ Catherine Temerson, Evelyne Lever (2000). Marie Antoinette: The Last Queen of France. Chapter 21-The Diamond Necklace Affair: St. Martin's Griffin. pp. 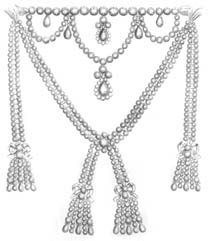 173–182–A whole chapter on the diamond necklace. ISBN 9780312283339. ^ Haslip, p. 81: "She never dared go out for long,...rest for a while in peace"
^ Deborah Madison (26 January 2017). The Illustrated Encyclopedia of Fruits, Vegetables, and Herbs: History, Botany, Cuisine. Book Sales. pp. 170–. ISBN 978-0-7858-3488-5. ^ Fyodor Dostoyevsky (July 2003). The Idiot. Vintage Books. pp. 196–198. ISBN 978-0-375-70224-2. Antoine, Michel, Louis XV, Librairie Arthème Fayard. Paris. 1989 (French). Castelot, André, Madame du Barry, Perrin, Paris, 1989. Haslip, Joan, Madame du Barry: the Wages of Beauty, Grove Weidenfeld, New York, 1992, ISBN 978-0-8021-1256-9, ISBN 0-8021-1256-0. La Croix de Castries, René de, Madame du Barry, Hachette, Paris, 1967. Loomis, Stanley, Du Barry: A Biography, Lippincott, Philadelphia, 1959. Saint-André, Claude, A King's favourite, Madame du Barry, and her times from hitherto unpublished documents, with an introduction by Pierre de Nolhac, New York, Mc Bride, Nast & Company, 1915; translated from the French Madame du Barry, published by Tallandier, Paris, 1909. Saint Victor, Jacques de, Madame du Barry, un nom de scandale, Perrin, Paris, 2002. Stoeckl, Agnes, (Baroness de), Mistress of Versailles: the Life of Madame du Barry, John Murray, London, 1966. Vatel, Charles, Histoire de madame du Barry, L. Bernard, Paris, 1883. Wikimedia Commons has media related to Madame du Barry.